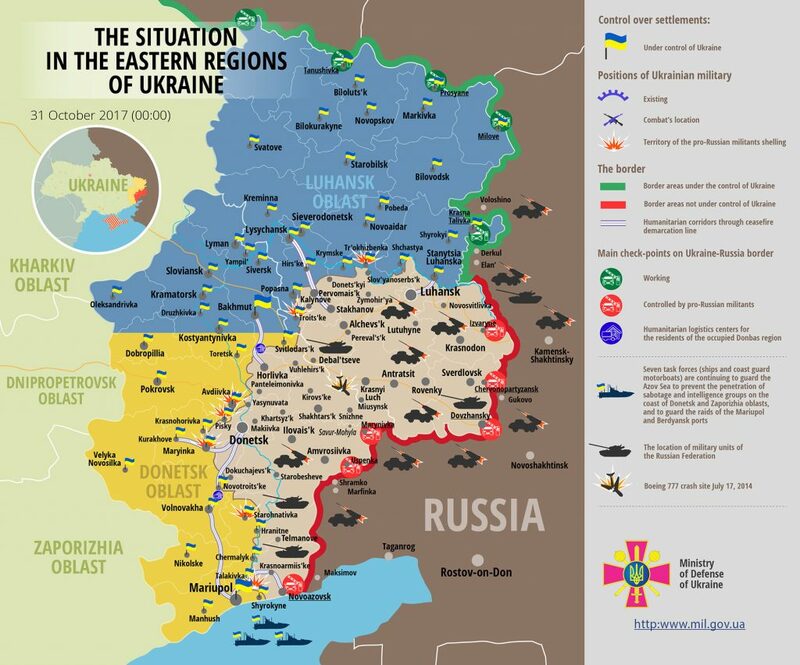 The situation in ATO zone did not change much in the last 24 hours. “Regardless of a certain decrease in the number of attacks at our positions, the ceasefire was periodically violated along the contact line,” reported Ukrainian Ministry of Defense spokesman on ATO Colonel Andriy Lysenko at a press briefing at Ukraine Crisis Media Center. In total, militants conducted 10 attacks on Ukrainian Armed Forces’ positions along the entire frontline. Ukrainian troops returned fire seven times using weapons not proscribed under Minsk agreements. In Mariupol sector, Russia-backed militants attacked Ukrainian positions near Maryinka, Vodiane, and Starohnativka three times using small arms. “Moreover, Russian proxies used 122-mm mortar against Vodiane’s residential area firing two rounds,” said the spokesman. In Luhansk sector, militants were active late at night, when they shelled Ukrainian Armed Forces’ positions near Triokhizbenka once with 120-mm mortars. “They fired the total of six rounds towards Ukrainian stronghold. Our troops responded to hostile mortars with grenade fire,” elaborated Col. Lysenko. In Donetsk sector, militants violated the ceasefire six times, mostly in the morning and in the afternoon. “Russian proxies mostly used infantry weapons near Avdiivka and Pisky,” said the spokesman. Ukrainian troops returned fire using weapons not proscribed under the Minsk agreements. No Ukrainian serviceman was killed in action. “However, one soldier was wounded in a hostile shelling near Starohnativka and was promptly evacuated to Volnovakha district hospital,” elaborated Col. Lysenko. Report on the military developments as of October 30 is available here. Interactive data on the shelling: chronology shelling chart and the interactive map.